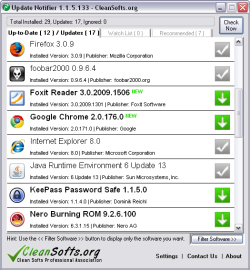 The Update Notifier is a small utility that scans your computer for installed software and displays a list of updates. The new BitTorrent 6 for Windows brings together BitTorrent's proven expertise in networking protocols with ÂµTorrent's efficient implementation and compelling UI to create a better BitTorrent client. WebUpdater is an application which communicates with the Garmin server over the Internet and updates your Garmin GPS with the most current software version available. Save your data with the most comprehensive backup and restore tool in the market. This cutting-edge backup software allows you to make a backup of your PC with the OS and apps. The brand-new Acronis True Image 11 is the solution you have been waiting. Defrag your drive - avoid fatal system failures and speed up your computer. GSpot is a video codec identification utility that identifies which video codec and audio compression method is used on .avi files, and if the matching codec is installed. Clean Softs Professional Association (CSPA) is a non-profit association that tries to introduce a new standard for verifying softs against viruses, spyware & trojans. The CSPA strives to show a professional image of the software industry.